When a hearing loss patient selects a hearing aid style—such as behind-the-ear (BTE) hearing aids—custom-fit earmolds are often needed to ensure optimum performance and comfort. An earmold is a piece of plastic, acrylic or other soft material shaped to fit a patient’s ear canal, and/or the outer ear structure (concha) surrounding the ear canal. Earmold styles vary according to level of hearing loss, and the style of hearing aid with which they’re paired. In many cases, earmolds sit inside the ear canal, hidden from view. Other times, earmolds sit in the concha bowl as well as in the ear canal. Because earmolds worn in the concha so closely match the ear’s natural contours and skin tone, they’re hard to spot. If you require or request a custom ear mold, your hearing care professional will take an impression of your ear canal and outer ear using a quick-setting silicone-like substance. The impression is sent to a specialty lab where it’s turned into a replica of your ear structures. Soft, dome-style earmolds are often paired with BTE hearing aids, and are worn in the ear canal. A BTE hearing aid is worn behind the ear, and transmits sound to the earmold via a thin, flexible tube. Canal earmolds are similar to dome-style earmolds. They're made from the canal portion of the impression, and are designed to be inconspicuous, while providing good ear retention and a customized fit. Canal molds require a relatively long ear canal to fit properly. No portion extends into the concha bowl—they're completely contained within the canal. Full-shell earmolds provide maximum ear retention, and are sculpted by the lab for a natural appearance. 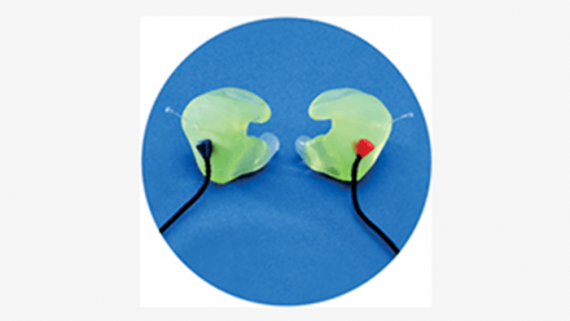 Full shells help prevent feedback, full shells work well for moderate to severe hearing loss. Skeleton earmolds have material removed from the center to enhance cosmetic appearance while still providing excellent in-ear retention. Designed for maximum comfort, a rim of material secures the mold within the concha, creating an effective seal. Semi-skeleton earmolds are skeleton earmolds without the back ring. Semi-skeleton molds work for people with limited dexterity. Skeleton and semi-skeleton molds are generally comfortable, easy to retain, and suitable for people with mild to severe hearing loss. Half-shell earmolds are sculpted like full shell molds, except the material is cut back to cover only the bottom half of the concha bowl. Patients need adequate ear-retention. Half shells are recommended for milder hearing loss. Some BTE hearing aids house the hearing aid receiver in the component worn behind the ear. Other BTE hearing aids actually house the receiver right in the earmold! These hearing aids are called receiver-in-ear (RIE) hearing aids. Most earmolds are manufactured with either small or large open vents–depending on the needs of the patient. Earmolds with larger vents are known as open fit, and are recommended for patients with good hearing in the low pitches. The vents allow the low frequencies to exit the hearing aid naturally. Large venting also contributes to more natural sound quality and less occlusion, or “stuffy” feeling. It’s important that your earmolds fit well, work with your hearing loss and hearing aids, match your level of dexterity, look cosmetically appealing, and feel comfortable for an extended period of time. Custom earmolds are also worn for reasons besides hearing loss. They can be worn to prevent hearing damage during “loud” activities such as playing or listening to music, racing cars, hunting, and so on. Also, they’re used by certain professionals, such as doctors, pilots and newscasters. Custom-fit Bluetooth® earmolds give everyone the benefits of hands-free and comfortable phone conversation. And earmolds paired with MP3 players let you move freely without “losing” your earbuds.